Following the high of the Croydon result, the Fish were brought back down to earth this weekend with a 0-3 home defeat to fellow strugglers Bearsted. 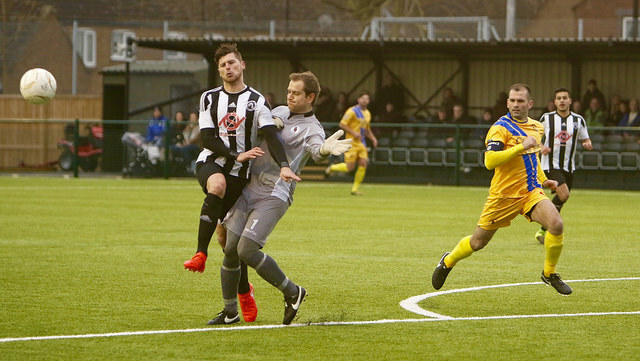 Alongside dropping points at home, Fisher saw results elsewhere go against us and dropped back to the foot of the table – though the entire relegation picture is changing every week, with just three points separating the bottom five sides in the battle for SCEFL Premier Division safety. Speaking after the match, Dean Harrison was left to reflect on missed opportunities. The home side played well, but Bugden and Haidarovic both having chances to open the scoring before Bearsted’s Mike Holliday gave the visitors the lead on the brink of half time with a free kick. In the second period Deano made changes to try and force the equaliser, with Munoz and Hewett entering the fray to freshen things up. However, for all that the Fish pushed on it was the visitors who grabbed the second goal, Matt Garner making is 0-2 with 17 minutes left to play. With Fisher stretched trying to find a way back into the game substitute Tom Bridges made it 0-3 in stoppage time, rounding out a frustrating day for a Fisher squad who spent a good amount of time directing the game at full time. Did we lose the battle physically? No. Were we poor defensively? No. The second goal we could have dealt with better but the first was a great free kick against the run of play and the third was in the last minute on the break when we went three at the back. Did we play the majority of the game in Bearsted’s half? Yes but we didn’t take our chances. We are on our travels for the next couple of weeks, with a trip to 8th place Cray Valley PM this Saturday before heading to midtable Corinthian on Saturday 11 March. SCEFL action returns to St Paul’s on Saturday 18 March with a HUGE game against Lordswood, who sit 4 places ahead of us – but importantly only 3 points ahead with a significantly worse goal difference. Photograph © David Anderson. As ever that are more fantastic match images on Dave’s Flickr page.